Sometimes, you have to install a screw in a location that’s too small for your hands to hold it in place. A magnetic screwdriver is great for these applications but for brass or aluminum screws it’s no help. Instead, try using a piece of plastic food wrap! Push the screw into a piece of food wrap (10″ x 10″ or so) and then set the screw on the screwdriver. 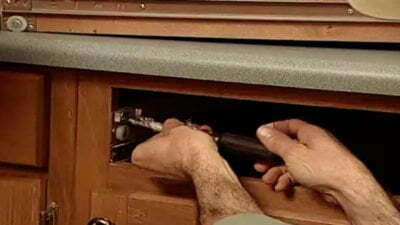 Pull the plastic wrap back around the screwdriver to hold the screw in place while you tighten it up. When you’re done, simply pull the plastic off of the screw. Man, this is a fantastic tip. Thanks a bunch. Very useful. Lateral thinking. Great tip! used to use a little masking tape. very similar procedure. get screw started firmly, then pull screwdriver back (with attached tape) before fully tightening screw. Thanks for the tip! I’ve got these tiny screws for mounting my solid state hard drives – really a pita until I got your tip.